Yup, after some months, here is a new version of SeriesFinale. This new version doesn’t have many new features but brings an important one related to my previous blog post: the context menu. 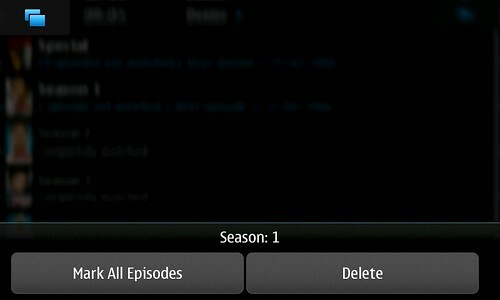 When long-pressing a show or a season, a dialog will be shown with some actions. On the show’s context menu (or context dialog? 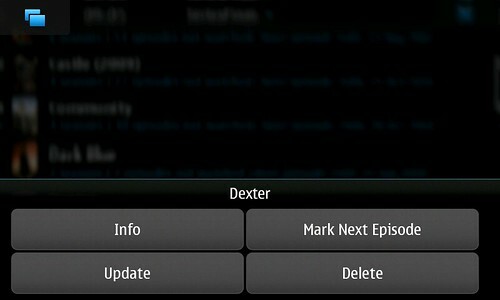 ), the user can update it, delete it, view its info or, more importantly, mark the next episode to watch as watched. On the season’s context menu, it can be deleted or, as many users have requested, mark all episodes. Of course that by only seeing the screenshots you don’t get the same feeling has when you quickly open the dialog and mark the next episode to watch so give it a try. It it already in Extras Testing and if it works well for you, please vote for it to get into Extras. This summer I bought myself an Android phone. That’s right, because of pure curiosity and with the help of Nokia’s decisions regarding MeeGo, I bought a Samsung Galaxy S.
I’ve been using it ever since as my main phone but I didn’t want to leave SF unattended yet. There are a couple of things more that I want to do and I’ll keep an eye on the download statistics to try to guess how many people is still interested in this app. I haven’t yet found a full replacement for it on Android. I’ve installed a few apps that either don’t work well, require login or are bloated with features making it harder to use so I don’t know if I’ll end up contributing to some FOSS one or developing an official port of SF. Do you think that developing an official version for Android makes sense? Also, people have asked me for a Symbian and Blackberry versions of it but I just don’t own any phone with these systems. As for SF on the N9/N950, a release could be out there soon so stay tuned. Eu son un dos usuarios de Series Finale e quero agradecerche que sigas traballando nesta aplicación, para min bastante útil. @dorfun, de nada. Alegrome que che guste. Series Finale is probably one of the applications most used in my N900, I use it daily. If you are thinking on porting it to more platforms, you could try with QML. This way, you would be able to build ports for Maemo, Meego Harmattan, Symbian and Android. In a short future, thanks to Qt 4.8 and Lighthouse, you could be able to build it for even more platforms. How about uploading this to Debian? Hey guys, thanks for your support. @foor, what do you mean upload this to Debian? You mean the GNOME version? @P, wow, you bought an N900 because of SF? There are some apps already for Android with the same purpose. The most complete one I’ve seen is SeriesGuide but it is a bit bloated with options and I prefer the way SF is organized. Still, don’t know if it is worth porting SF if SeriesGuide already exists. It’s one of my favorite apps on n900. Keep up your awesome work. I’m the author of SeriesWatchers (http://xf.iksaif.net/dev/serieswatcher.html), it’s a Qt clone of SeriesFinale, but the project is currently dead. As Ivan say, if you are planning to port it to more devices, you may want to consider QML, and some code from SeriesWatcher may be used. I also got an Android device recently, and I’m using TV Show favs, it’s no FOSS, but it’s quite usable. I’m already porting SF to QML for the N9 but I don’t really know how mature Qt is now on Android in order to use this code for an eventual port. It seems slow to get the updates, but otherwis seems OK. Is it one you have tried? Yeah, SeriesGuide is the one I’ve tried. I find it a bit bloated with options but is does a good job. I think I just prefer the way SF is organized but yeah, SeriesGuide is the one that makes me wonder if I should NOT port SF to Android because of it doing a good job. Thanks for your comment. I’m glad SF helps you. I’ve already submitted SF to the Ovi store (for the N9) and it is pending QA. Once it gets through I’ll post about it. I just wanted to thank you for SF. It is handsdown the best app to track series episodes, not just for the n900 but for every smartphone out there. I couldn’t find a match neither for Android or iOS. Today I’ve received an N9 and if there’s an app I’m waiting for, to make it to the store, is SF. Do you have a donations paypal account or something? Hi Sergio, thanks for the kind words. Given that my time for working on SF is not much, I’m trying to figure out the best way for users to support it, I’ll probably post something about it when I figure out the best way to do it. i’d be interested in an android version. best app ever, for any tv viewer. I would like a Android version. Ther is still nothing good for Android. helllo sir, i would like to ask if i installed the seriesfinale application right, because it does not play as a video but just information about the episode, my unit is also a n900. SeriesFinale is about giving info about episodes as well as keeping track of the progress of a show, not about watching videos.